About 340,000 eligible parents can expect to receive their quarterly Child Care Rebate payment from this week. Acting Minister for Human Services Anthony Albanese said the Child Care Rebate supported working parents by providing them with financial assistance to meet the costs of child care. “Of the 700,000 Australian families who receive the Child Care Rebate, about 340,000 choose to receive it quarterly,” Mr Albanese said. Minister for Early Childhood and Child Care Kate Ellis said the Australian Government had made a record investment to help families out with the cost of child care. “We’ve increased the Child Care Rebate from 30 per cent to 50 per cent of all approved out-of-pocket child care expenses up to a maximum of $7500 per child per year to help families out with the cost of child care,” Ms Ellis said. Mr Albanese said that even if parents are not entitled to Child Care Benefit, they may still be eligible for the Child Care Rebate. “Families who receive their Child Care Rebate payments quarterly will begin receiving their second payment and statement for the October to December quarter this week,” he said. “If families have not received the payment in their bank account by Friday February 1, they can check online at humanservices.gov.au to see whether their quarterly Child Care Rebate payment has been issued. 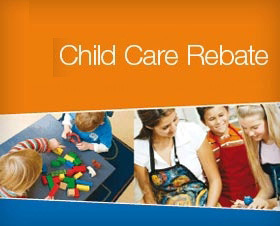 “To find out more about Child Care Benefit and Child Care Rebate visit humanservices.gov.au.